The object of Funky Monkey is to obtain a winning symbol combination by spinning the reels. Note: the lowest winning combination, “Any 3X Bar”, means that there must be a bar symbol on all three reels. 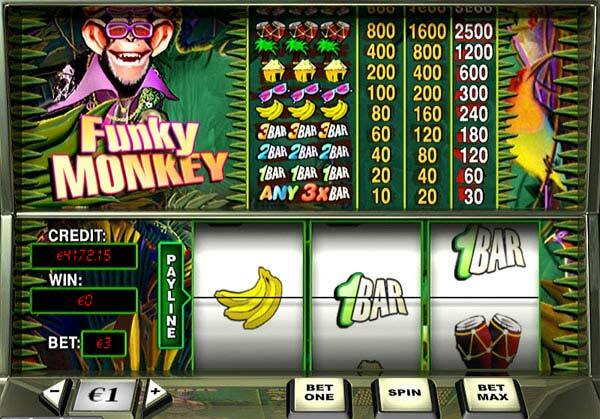 · Click Bet One or Bet Max to select the number of coins you wish to wager on Funky Monkey. Each click on the Bet One button increases your bet by one coin. · You can also bet by clicking on the corresponding column in the paytable (the leftmost column bets one coin, the middle column bets two and the rightmost column bet three coins). Using the wintable also spins the reels. · Pressing Bet Max will increase your bet to the maximum amount possible – that is three coins (or less, if you do not have enough balance) – and spin the reels automatically. · Click Spin (if you did not press Bet Max or use the paytable), or the arm to spin the reels.